I have sold all my 9.3" Olds/Pontiac rearend parts. A fellow from Sweden who is a dyed in the wool Pontiac man bought the whole lot and had it shipped to Scandinavia. Amongst the cars he has there are a '57 Safari wagon and several '61 - '62 Catalinas. One of the Catalinas is a genuine factory race car with aluminum front sheetmetal and trunk lid and has the dual quad engine with full length cast iron headers. I have only seen one of these up close and personal in the early '70s...... The engine was apart and laying in the trunk and the fellow who owned it gave me the 4-speed in payment for some work I did for him. I had just installed a hot running 327 in my '55 Chevy business coupe and I put the 4-speed in my '55. Last edited by enigma57 on July 10th, 2013, 5:34 pm, edited 1 time in total. BOHICA! - How's all that 'change' workin' for ya? I am split between Vintage Pontiacs & a C4 Corvette convertible of mine. 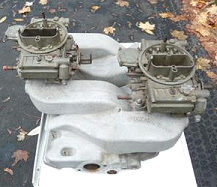 Would love to get my hands on a matching set of 1962 late to Jan 16 1963 Pontiac Super Duty 421 D-port "980" heads. Best flowing & balanced stock iron Poncho heads ever made. Next to my 1970 Ram Air 4 "614" heads. Round port exhaust. You can flip those 405 HP ratings around. Actually 504- 550Hp flywheel Hp a late 1961-1963 421 SD daul quad. My dream Wide Track Tin Indian is a 1961 Bubble Top Ventura. Build it with a 421 or 455. Stroke for 477 ci. Race gas normally aspirated 850-900 Hp. Street drive on occassion too. Have Ram Air 4, Super Duty 455, 1970 Trans Am parts in hand always. I like to Horse trade. Ultra rare Mickey Thompson speed parts are intetesting too. I helped Dan Miller with his early hemi EMC engine before he passed on and we were going to build a similar set, but size the large collectors to double as pulse wave terminator boxes as per David Vizard's research. You have some very Kool Vintage Speed parts Harry. Micky Thompson made some very unique parts back in the day. He also made Pontiac V8 Hemi cylinder heads. Aluminum castings. Never seen a pair in my lifetime to touch & admire. Legend has that on a 1959-66 Pontiac 389 with a welded up & stroked Forged early 389 Crank to 4.300" stoke , standard bore size of4.0625 " & 6-5/8" rods & Thompson Hemi Heads, 10-30% Nitro mix, crazy power was made & reliable. 6-71or 8-71 supercharger used of course too. 8- Second 1/4 mile times in an Altered wheelbase steel bodied doorslammer like a 1965 or 1966 GTO. I Love Nostalgia Speed parts & drag racing. He is originally from England. Grumpy Rivals him for experience. 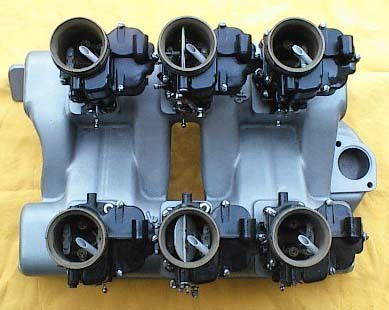 $530 - Hilborn 265 C 8J fuel injection intake with 2-3/16" throttle blades for small block Chevy. Manifold with throttle shafts and blades and some linkage. 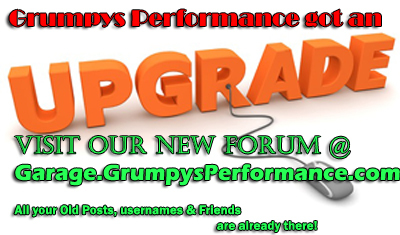 No ram tubes, injectors nor pump, etc. Just manifold and throttle blades with some linkage. Shafts, throttle blades and linkage move freely. Intake is in very good condition. * Hosting website für Fotos ist kaput! Can send photos via E-mail. If interested, send PM with your E-mail address. Last edited by enigma57 on November 30th, 2014, 2:40 am, edited 4 times in total. Made separate ad for 360 Dodge engine. 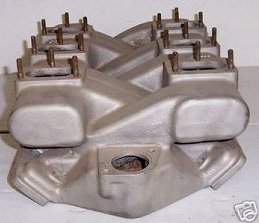 Bowtie block and rotating assembly to build 427 stroker small block have been sold! 350 Chevy L31 short block is no longer for sale. My son will be using this in his Camaro. Remainder of parts listed are available for sale. Last edited by enigma57 on December 13th, 2015, 1:12 am, edited 2 times in total. $2,300 - Victor Jr. heads with full portwork by Mondello, intake ports matched to 1209 gasket size, 65cc chambers, 2.08" /1.60" valves. Intake side flows 306 cfm @ 0.525" lift per Mondello. Last edited by enigma57 on August 5th, 2018, 1:58 am, edited 2 times in total.